As winter arrives in the Churchill Wildlife Management Area in Churchill, Manitoba, a Polar Bear spends time relaxing on the cold ground which has been blanketed with snow. A Polar Bear does not get much cuter than this one who is relaxing on the snow covered landscape at the onset of winter in the Churchill Wildlife Management Area in Manitoba, Canada. 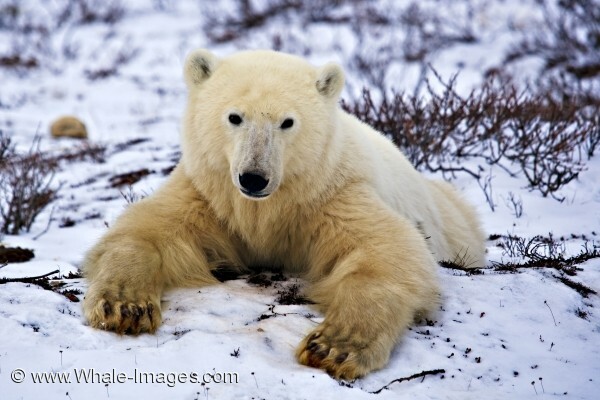 With his front paws stretched out in front of him and his back legs in a similar position, the Polar Bear enjoys the coldness of the ground, something he has been waiting for. The intake of food for a Polar Bear is minimal during the warmer months and many hours have been spent relaxing. Conserving energy is what this Polar Bear has been doing so that he is ready to hunt Ringed Seals along the icy shores of the Hudson Bay in the Churchill Wildlife Management Area. Relaxing is something a Polar Bear enjoys all year round, but during the winter months, it usually happens after a good meal of Ringed Seal. Although this Polar Bear looks at ease, it can be very quick on its feet and be ready to fend off any signs of danger within seconds. This Polar Bear allows us to have a good look at his massive paws which can reach 12 inches in diamater. The forepaws are round with long hairs growing between its pads and toes to help slipping as his feet act like snowshoes while crossing over the icy landscape. Each of its toes have a thick, curved claw which aids the Polar Bear in capturing its prey and as a means of traction for climbing or running. The Polar Bear has a large elongated nose which is broad and black and the dark brown coloring of its eyes are set close together. The ears are very small and rounded in comparison to the size of a Polar Bear's head, all which is surrounded by a thick coat of yellowish to white colored fur. The Churchill Wildlife Management Area is a place that the Polar Bears call home and they are the largest predator found throughout the world. Tundra Buggy tours are offered in Churchill, Manitoba which take people to Polar Bear territory to watch these beautiful animals in their natural environment.